Bristan has launched three new ranges of contemporary bathroom taps, Hourglass, Sail and Pivot, enabling installers to offer their customers stylish and affordable designs straight from the merchant counter. The Bristan Hourglass range features an elegant curved base and angular handle, which sits perfectly with either contemporary or traditional style suites. Taking inspiration from a latest Italian trend for taps with handles close to the spout the Bristan Sail range of taps features neat lines, offering a chic and minimalist designer style. Additionally, the new Pivot range of taps has a fun and playful curved design, best complimented with contemporary sanitary ware to create a real standout bathroom. All three new ranges have been designed in house by Bristan’s design team. Bristan has taken inspiration from the latest style trends from across the globe to bring fashionable design-led ranges to installers, at affordable prices. Rachel Smith, marketing manager at Bristan, said: “Hourglass, Sail and Pivot demonstrate how Bristan has its finger on the pulse where design is concerned; our in house design team draws on the latest trends worldwide to create bold and chic new styles. The Hourglass is a real showstopper with the potential to be a design classic, while the Pivot and Sail ranges really stand out from other taps on the market. 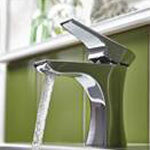 All ranges consist of basin taps, bath taps, basin mixers, bath fillers and bath shower mixers. Prices start at an RRP of £110 and come with a five-year guarantee, as well as the backing of Bristan’s comprehensive customer service package, Bristan Care, which includes technical support, spares store and a full team of afterservice engineers.